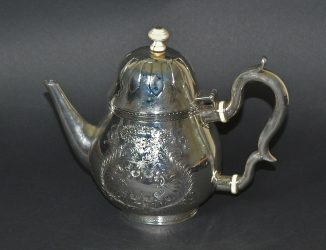 Owned by John Jay’s wife, Sarah Livingston Jay, this c. 1710 Peter Van Dyke (1684-1750) teapot was originally made for her Aunt and passed to her through her mother. It was owned by three subsequent generations of the Jay family until Pierre Jay (1870-1949) loaned it to the Metropolitan Museum of Art, where it spent years on display in the American Wing. In 1977 Pierre’s daughter, Anna Maricka Jay Harvey, donated it to the Homestead.